As the disease progresses, the diaphragm (the muscle that moves air in and out of the lungs) will eventually fail. Your physician will monitor the strength of your lung muscles, and when function reaches a certain point, he/she will recommend a respiratory-assist device called a ventilator. 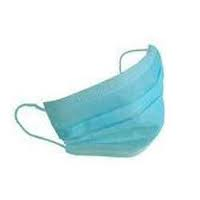 My ventilator is connected to a face mask, nasal mask, or nasal pillow, not a tracheotomy tube. What is the ventilator used for? Use your ventilator as soon as it is available. It takes time to get comfortable with this machine. DO NOT WAIT UNTIL YOU FEEL SHORT OF BREATH. Delayed use with associated shortness of breath can cause anxiety, making it more difficult to get comfortable using the machine. The ventilator is one of the very few treatments for ALS that is likely to PROLONG YOUR QUALITY OF LIFE! Your lung function tests will be abnormal even before you become short of breath. These tests are the best indicators of early lung muscle failure, suggesting the need for a ventilator. Shortness of breath will initially be most noticeable when you lay down or after prolonged speaking. It is also common to feel shortness of breath after a PEG tube feeding, even if you consume a small volume. Using your ventilator 30-60 minutes or more following feedings helps this problem. 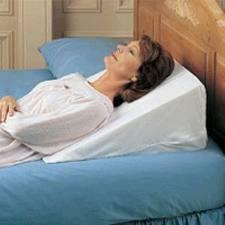 Elevating the head and upper body with a triangular wedge will also decrease the sensation of shortness of breath while lying down. 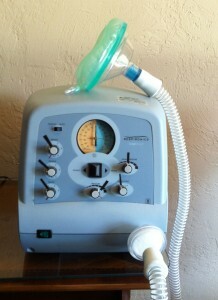 Your respiratory therapist will apply the appropriate settings and show you and your caregivers how to use the machine. In the majority of patients, including myself, initially coordinating the normal, natural breathing rhythm with the machine will be awkward. The machine breaths may feel too large or arrive at the wrong time, but this awkwardness will disappear with adjustment by your respiratory therapist and with time. If you have trouble adjusting to the ventilator, try using it while doing a distracting activity, such reading or watching TV. It is very important to use the machine as often and as soon as possible—especially at bedtime or whenever you feel tired or short of breath. The addition of a humidifier to the ventilator may also help you adapt to using the ventilator. UPDATE 3/13/14: Have an extra AC cord (same kind that comes with the ventilator that connects the ventilator to the electrical outlet on the wall) on hand in the car for back-up. Also, consider having a DC/AC adapter in the car in case of the ventilator battery becomes depleted while you are on the road. The ventilator may dry out your eyes. Your body may respond with tearing of the eyes. Lubricant eye drops may be helpful to decrease the dry eyes, ultimately decreasing the tearing. UPDATE 3/12/14: One of the more irritating aspects of ALS in my opinion is repetitive tearing from using the ventilator 24/7. My eyes often alternate between feeling both dry and scratchy (making me blink or close my eyes to keep them moist) or tearing up to the point where I have tears dripping down my face. There is no perfect solution. However, I have used regular eye drops when my eyes feel dry. This has not worked well for me. I have had more success with using the eye drops regularly as prevention before my eyes feel dry. Recently, I have started using a new type of over-the-counter eye drops, called Retaine MGD. The manufacturer claims that its effects are longer-lasting than typical eye drops because of how it’s made. So far, it seems to be better than anything else I’ve ever used. I have also found it more useful to dry my eyes with a wet towel rather than a dry one. The ventilator may also dry out your nose, causing your nose to run. Turning up the humidifier may be helpful to decrease dry nose, ultimately decreasing the runny nose. However, if you know your runny nose is due to a cold or allergies, you can turn down the humidifier to dry it out a bit. As the muscles of the throat weaken, or as ventilator settings are increased, the ability to direct air or food into either the lungs or stomach begins to fail, and things go “down the wrong tube.” When food/liquids go into the air tube, this creates a feeling of choking and increases the risk for pneumonia from aspiration. When air enters the feeding tube, there is bloating, distension, and possibly cramping. This can be a very serious issue, as it can make breathing even more difficult and can be VERY painful, potentially require hospitalization. To relieve the gas that uncomfortably expands the belly, you can release it through your PEG tube before it becomes a problem. This can be done by connecting your PEG tube to an open 60 CC feeding syringe with the plunger removed. The stomach air will then be able to escape freely through the open top of the syringe. Hang the syringe as low as possible without letting fluid backflow into the syringe. If done correctly, you will hear the air gurgling out of the syringe (especially after a feeding). After each PEG tube feeding, I purposely leave my syringe open to air out the gas for as long as possible. I loosely cover the open end of the syringe with a small piece of aluminum foil to keep liquid from splashing out when it gurgles. I have significant problems with air building up in my stomach and intestines unless I consistently air out (open) my PEG tube. Now, I avoid closing my PEG tube cap besides when I have company or go out. Itching of the scalp may be due to hair being pulled on by the ventilator harness. Have someone slide their fingers between the harness and hair to release the “hair tug.” A short haircut may also be helpful. Keep your face as dry and as clean as possible. Oily skin or lotion can prevent the mask from sealing tightly onto your face. When this occurs, consider washing your face and cleaning the mask liner to restore the seal. As the disease progresses, there will be increased difficulty with swallowing, resulting in drooling, coughing, and saliva potentially going into the lungs, producing pneumonia. A common misunderstanding is that patients with ALS produce excessive mucus, but this is NOT true (http://alsn.mda.org/article/managing-saliva-als). The problem is not with overproduction, but with the fact that the saliva collects in the mouth/throat because of difficulty swallowing. Personally, I have been able to manage my problems so far with coughing/choking on my saliva, especially in the evenings or early morning, by decreasing the moisture setting on my humidifier. The setting is decreased to the lowest setting that I can tolerate when I wake up in the morning. Typically, I will wake up with a dry mouth with some thickened saliva, and my tongue feels almost cracked. I will then smack my tongue several times to start saliva production in my mouth and then suction out the saliva with a portable Yankauer-type suction device. This will need to be done several times until the thickened, dry mucus from overnight is cleared. In addition, throughout the day, especially in early morning or whenever I feel saliva collecting in my mouth, I have my caregivers aggressively suction the front of my mouth. I do not do deep suctioning in the back of my throat, but rather, have the tip of the suction placed in the mid portion of my tongue and I will close my lips around the suction wand (like at the dentist). I only keep my mouth closed for a few seconds to allow the suction to work, pulling saliva from my mouth/throat. If I keep having problems, I will consider taking liquid pseudoephedrine (Sudafed) through my PEG tube. This will also have the added benefit of decreasing mucus production from my sinuses. The above stated treatments may do the trick for you, but if not, you may also speak to your physician about drying your mouth with medications (anti-depressants, anticholinergic drugs, Botox injections). Also, at first thought, you may think about decreasing water intake- do not do this! Decreasing water intake will have negative side effects, such as dehydration, dry mouth, constipation and abnormal thickening of the existing saliva. I do not restrict my water intake, but rather am generous with my water intake through my PEG tube to avoid the negative side effects. 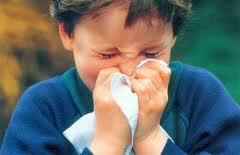 Be careful when around others with colds, who are coughing or sneezing. Warn your caregivers that since you have a poor cough, it is much more difficult and dangerous to have a lung infection. Ask visitors if they have a cold, and if so, please have them delay seeing you until they are no longer sick. You are not at higher risk for getting a cold, but it is more difficult to cough out fluid in the lungs. 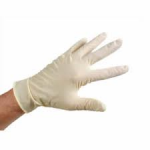 If necessary, have those around you who are sick wear a disposable mask and disposable gloves or frequently wash their hands with soap after touching their eyes, nose, or mouth. Over time, as the disease progresses and lung function decreases, your breaths become smaller. As this occurs, there will be small areas of your lungs that may not expand normally. In addition, your lungs and the surrounding areas around your lungs may not expand normally, causing more difficulty breathing. To help correct this problem, your physician may prescribe a cough assist machine. What is the cough assist machine used for? How does the cough assist machine work? After being prescribed, EARLY and CONSISTENT USE of the cough assist machine is very important since it will help keep your lungs stretched, so they can expand normally. This machine should be used when you wake up in the morning, before you go to bed, or any time you’re unable to cough up anything that gets stuck in your throat. Consider doing an extra exercise after prolonged periods of sitting or lying in a position in which you may not be able to fully expand your lungs. Your respiratory therapist will show you and your caregivers how to use the machine and apply appropriate settings. There are multiple settings, which can be adjusted. If your settings are controlled by knobs, they can be accidentally moved, so I suggest marking the knob positions with black electrical tape immediately after your settings are determined. If the portable Yankauer suction device is unable to remove the liquid or food from your throat, consider using the suction setting on your cough assist machine. An alternate method to using the manual suction switch, which will free up one of your caretakers hands, is to turn the “Inhale” and “Pause” knobs to zero (top left and bottom left red knobs in the picture). 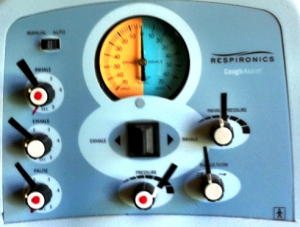 Notice that the red line for the pressure setting (center red knob) is variable and should be determined by the respiratory therapist. No red line was placed for the pressure setting in the picture shown. Please confirm this suction method with your respiratory therapist prior to use. Sorry for the late response. Different tip attachments are used for the nose and mouth, so it doesn’t matter what order you suction in. You use the same suction machine, though.